The Snooze Button Generation scored another celebrity interview. This time, we caught up with Bill Nettles, who was an electric football pioneer and best-known as being the quarterback for the champion team "The Yellow Guys." With football season starting, Nettles seemed like the perfect interview for the Snooze Button Generation. He is promoting his self-published book about the short-lived Electric Football League titled "When the Power Went Out: How Technology and the Greedy NFL Doomed the EFL." ... We met up in a hotel restaurant in downtown Long Beach. Snooze Button Generation: Wow. We at the Snooze Button Generation feel privileged to meet you and interview such a football pioneer. We ran across a photo of you in college (see above) and want to ask you this - how did you make the transition from college to the pros? Bill Nettles: Well, it wasn't easy. In electric football, back when I played, many college players, like myself, were painted. We had numbers, a lot of flair. Then, when I got to the EFL, I was simply "a yellow guy." At first, it was a bit disconcerting to have no number and have my skin match my uniform. But after a while, I got used to it. SBG: Let's talk about your book. In the title, you mention how "technology and the greedy NFL doomed the EFL." Would you say they both equally doomed electric football or was one more the cause? Nettles: That's hard to say. I do know that, despite all the advances we've seen in technology, it's a shame the EFL isn't around and that more people don't play electric football. It's a beautiful game. You got the hum of the field, and there's an occasional electric shock for the coaches. So much can change with the flick of that red "on" button. Nothing says autumn to me more than the subtle smell of that tiny foam football. SBG: OK. But my question is this - what ultimately doomed the EFL? Nettles: I would just say it was ourselves, Americans. 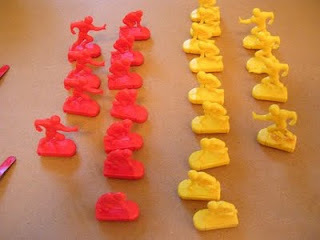 We're not patient enough to take five minutes to set up the yellow or red guys for a five-second play. We still get upset if a friend has to go to the bathroom and accidentally steps on and crunches one of our bench players. We don't put in the time to truly cherish the red and yellow guys. We're the "now" culture. We want instant gratification. SBG: Do you think there's any chance electric football will get popular again, and could we see a resurgence of the EFL? Nettles: Ahhh. Part of me says it's impossible, that too many people are into the NFL and college football and that technology has given us too many other football options. I mean, look at all the fantasy football leagues out there. That's ridiculous. ... Still, another part of me wants to believe it can happen. I guess I do keep hope alive. SBG: In your book, you're very critical of the NFL, especially with instant replay. Is there any part of the NFL that you enjoy? Nettles: As you alluded to, yes, I am critical of the so-called technological advances in football. I think instant replay slows down the game. There are way too many commercials, and the yellow line on TV to denote the first down is distracting. But, hey, one glorious moment, untainted by technology, makes it worthwhile for me. I love when the referees hold the fate of the game in their hands and must try to run a straight line to the middle of the field and measure for a first down. Imprecision is beauty. The unscientific measurement of a first down simply is beautiful. That Nettles was one tough hombre. I coached against him several times. I recall one game where he was injured and the trainer had to "hot glue gun" one of his legs back on at the half. He came out and ran in circles the entire second half. Amazing!